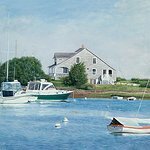 While on the Cape go to the O'Malley-Keyes Fine Art Gallery in Teaticket and view some of the finest photo-realistic works of art available created by artist Julia O'Malley-Keyes. The first time I saw Julia’s jaw dropping work all I could think is that someday I will have an appropriately wonderful home and then I will own one of these magical pieces of art. When my wife and I were on vacation last spring, I was told of a local artist who did good work and that I should stop in and check out her work. When we got to the gallery, I was absolutely floored by the top shelf quality art I was looking at. Julia couldn't have been a nicer more personable host and I walked away enriched for the experience. If you are in the neighborhood, do yourself a favor and stop by - you'll be a new person! Her marine paintings are good as any you will see anywhere. Boats, sails, skies and wonderful wet water are all executed beautifully. O,Malley Keyes produces outstanding paintings, many of Falmouth or local Cape Cod. The studio is small and pretty and filled with art. The artist was not there when I visited. The studio has limited hours so check before you go. The paintings are VERY expensive but you can purchase prints (also quite expensive). I was there just to browse but would recommend this artist to collectors who want some seriously fine art depicting the area.